There I Am – All Shiny & Happy! A few months ago I registered for a fitness convention that I have been dreaming of going to for the past 4 years. I was never able to make it due to, well, life! It was finally time to go and take it all in! IDEA World is like the mother of most fitness conventions. It brings together just about everyone in the field of fitness and it’s HUGE! Like overwhelmingly huge if I am going to be honest. This year I was so excited that I could go – representing Vfit! There was SOOOO much to learn. Workshops, lectures, business courses and more! How exciting that I could go soak all of this “knowledge” in and then bring it back to my team. I planned my schedule very meticulously. I wanted to LEARN! Anatomy, physiology, hard science, more about marketing, branding – AS MUCH I POSSIBLY could LEARN! I PACKED my schedule for the entire 4 day convention. I am tough, I could handle it….. The first day was fantastic. I took a session on strength training, a few business courses and an incredible lecture on barefoot training. My brain felt FULL already……8 hours of learning and geeking out. But I didn’t plan in one single workout that day. Something felt off in my heart. It’s not like I “had” to workout at this conference. I workout plenty. In my meticulous planning, I figured that I didn’t need that part of the conference, so I kept that part of my schedule fairly light. Fast forward to day 2…..
As I was walking into the my scheduled business planning session, my heart became distracted. I heard some great music and saw a group of others going into an adjacent room. The energy pulled me over, so I read what session was about to go down in that other room. There are about 50 different sessions going on at any given time. This particular session was a 2 hour workout sampler held by Lifetime Fitness ( a big brand of workout clubs). My brain – you know that so called logical part of our bodies was saying “You don’t need this workout. It has nothing to do with your business, these aren’t even formats you can bring to VFit, AND this is not what you PLANNED on!”. My heart however was ready to pick the fight. I just wanted to move…. to sweat….. to be a student and to rock out. Thank goodness that strong heart of mine WON! That session was one of the most memorable and inspiring moments from the event. I got lost in the music, the sweat, the movement and so much more. In those 2 hours I was challenged, I was humbled, I had some serious inner moments with myself, I did things I didn’t think I could and I felt ALIVE!! 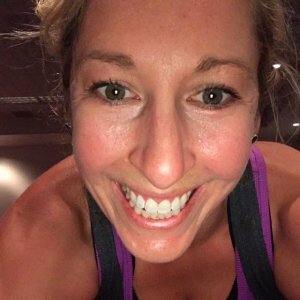 ALL of the very feelings that first got me hooked on group fitness and eventually brought me to launching VFit. I felt a strong mission to share this power with the world. Taking this shift off my planned course in the conference was a pivitol moment for me. I don’t think the “me” from a few years ago would have jumped ship on her “plan”. Another sign that this was the year I was meant to attend. From there on out I ditched my “planned” schedule (for the most part). I went standby into most sessions and changed my whole approach to what I was there for. I left a lecture that just wasn’t doing it for me, I showed up to an incredible motivational session I wasn’t signed up for and I ended my time there with willPower……… my comfort…..a format that feels like home to me…..where it all started for me many years ago. It was the sessions that I added on a whim that filled my inspiration tank more than I can express. And while they were not “learning” in the conventional sense of what I had in my mind going into this, they are the sessions I learned the most from. I learned how passionate I truly am about fitness. How fitness is SOOOOO much more than just perfecting a squat or push-up. Yes, those are important, but not if you don’t continue to show up. Fitness makes you feel good! BUT if you don’t have fun in the time you are with our team, if you don’t feel a deep connection, if you don’t leave you workout feeling like a better person, NONE of the other stuff matters. None of the other stuff matters if we can’t keep you motivated to SHOW UP and do something YOU so deeply deserve. We all know we need to exercise. Knowing isn’t enough to get most people to take action. And while I have always brought my passion to our members and trainer team, this experience has catapulted that to another level. While I may not have learned to measure exact Vo2 max during HIIT training like I had planned to, I have refilled my own personal tank to FULL. I am so excited and ready to share this with the world! “Everything is falling into place”. And as it should be! If you take anything away from what I’ve shared above, follow your heart! Find what lights you up! Surround yourself with the people who make you better version of yourself and do the things you enjoy! Have fun, don’t take life so serious and it’s ok to change you plans! !